With X-Men: Grand Design, Ed Piskor may be the first creator in the history of Marvel Comics to have completely created a comics series "from soup to nuts." Piskor has written, pencilled, inked, lettered, colored and designed this entire series (not including, of course, the reprint of the original X-Men #1 by Jack Kirby and Stan Lee [which he did re-color, however, in PiskorColor™] which is included here as the Official Treasury Edition Bonus). 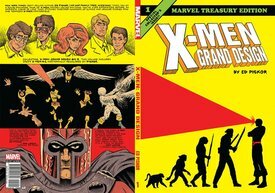 X-Men: Grand Design is a giant connect-the-dots (metaphorically speaking) that creates a single stand-alone portrait of the history of the X-Men. It is a task for which Piskor – having honed his chops on the four-volume Hip Hop Family Tree saga, published over the last four years by Fantagraphics – is eminently suited. And it is a task that he originated and assigned himself (as, more or less, an existentialist project) and then only subsequently brought to Marvel for them to sign off on – or not. Of course, not being fools, the powers that be at Marvel knew a good thing when they saw it, and signed on to Piskor's project, and the rest is history (still in-the-making!). Here, in this Treasury Edition format (the first ever for the X-Men, collectors please note), Piskor's project is presented as it was meant to be seen. 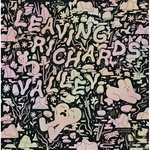 These pages are bursting with energetic and innovative cartooning. Piskor's decision to set the page/paper tone as an off-white to cream newsprint enables the most singular visual innovation of the series: the use of white as a color for dramatic effect. Time and again, the reader feels the impact of the white flashing out of the paper to highlight a scene or, especially, illuminate a power's action: Magneto's forcefield; Iceman's chill surfaces; and other exhibitions of mutant power. The bright white >pops< here on these pages in a way it hasn't ever before, and accentuates the uncanny at the core of the X-Men's appeal. And, best of all, this oversize Treasury Edition is only the first of three, so there's plenty more to look forward to!